I had no idea that August would be filled with so many unexpected (hence, my having no idea) reminders of the best of BBC science fiction, but it seems to have panned out that way. It started a couple of days ago when my wife and I were celebrating her birthday Downtown. We'd wandered into Golden Age Collectables to pick up some comics and graphic novels, when she spied a Doctor Who TARDIS mug (rectangular-sided, to make it look, well, TARDIS-like). Not unusual to find the Doctor's merch in a comic store, I just didn't expect to be buying any. But it was her birthday, so... "Happy wife, happy life" as my mother-in-law once instructed, and the TARDIS mug now has a place in our kitchen. Fast-forward to yesterday when my coworkers were throwing me a bit of a farewell celebration because my contract's come to an end (mental note: must tighten the budgetary belt and keep spending in the merchants' room under control at VCon in October). 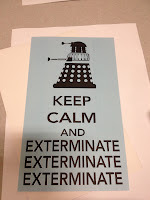 I opened the envelope and pulled out the extremely cool TARDIS card that my coworker and friend - and graphic designer extraordinaire - Nancy Berke (the same artist behind the new bloginhood logo) had created. Now, my coworkers all know that I'm a nerd, and two of them are fellow fanboys, but this was the last thing I expected to find. 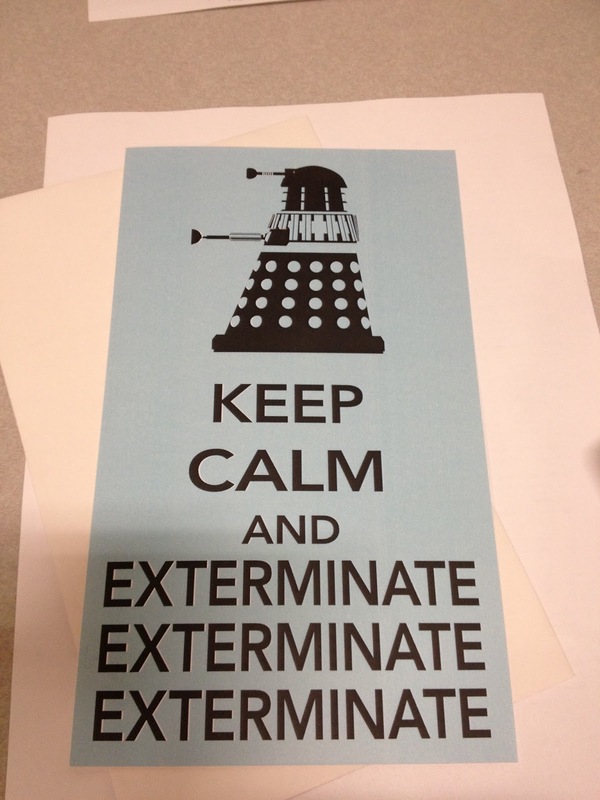 A Hallmark card, sure, but something tailor-made to my geekiness and printed in-house on high-quality paper? I probably enjoyed getting the card more than eating the cake they brought out - and that says a lot, considering my love of cake! The best was when Nancy brought out the alternate card with its Dalek design. I may frame that one and put it up in my study. Then there was the fridge that should be on the set of Red Dwarf. We've sold our house, and in preparation to move into the new place, my wife and I are combing through a lot of furniture stores to get ideas. A few days ago, she dragged me into some hipster home decor boutique on south Granville. 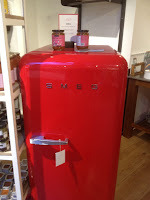 Wandering around on my own, wishing greatly to get the hell out of there, I stumbled upon this gem and burst into laughter: a compact, bright red refrigerator with "SMEG" proudly emblazoned across the front (in hindsight, I should have checked the back to see if the manufacturer was listed as the Jupiter Mining Corporation). Some of the resident hipsters spared me a brief, condescending glance, and then looked away - clearly too cool and lacking in vocabulary or knowledge of SF culture to understand the humour in what they were trying to sell. Sure, this thing would be a perfect addition to any nerd's basement to keep his lagers cold and his chicken vindaloos fresh while he's watching reruns of the short rouge one - so perfect, in fact, that for a second I was half-tempted to snag the fridge myself. 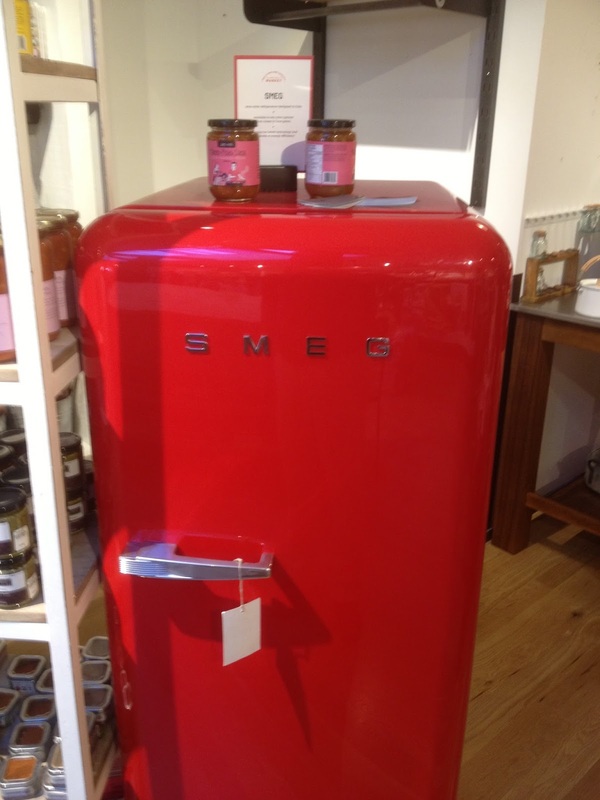 But even better was the fact that if you ignore the Red Dwarf allusion, then it would certainly appear that the manufacturers are proudly proclaiming that this fridge is best suited for duty in a hospital lab, specifically for the storage of urological specimens. Really, no self-respecting consumer appliance or home decor store would stock a fridge with a slang shorthand for smegma as its branding if they were aware of its definition. And, while hipsters do love their affected irony, it was pretty clear from the other merchandise in the store that there's little to no irony intended in their selection of wares. No, this is just an example of a purchaser thinking a loudly-red little beer fridge would be something that somebody would buy, with said purchaser being completely ignorant of what it's name meant. Which made it all the funnier. What a smeghead.